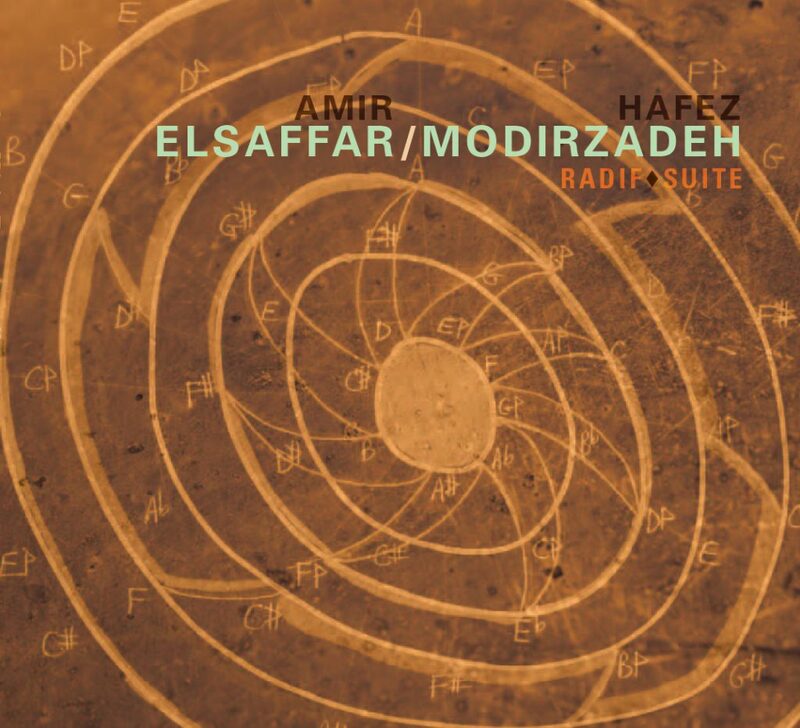 Radif Suite is an important new recording from trumpeter Amir ElSaffar and tenor saxophonist Hafez Modirzadeh. The CD is a cross-cultural exchange between the Iraqi maqam, the Persian dastgah, and American jazz. Both ElSaffar and Modirzadeh are of mixed heritage (Iraqi-American and Iranian-American, respectively) whose musical careers are dedicated to expressing their ancestral traditions within the jazz medium. ElSaffar has spent years traveling abroad seeking out masters who could impart to him the Iraqi maqam tradition. He released the highly acclaimed Two Rivers (Pi 24), his first major work joining maqam with contemporary improvised music in 2007. Modirzadeh had spent years under the guidance of Iranian master musician Mahmoud Zoufounoun and developed his own “chromodal” approach to intercultural musical practice, which allows for the co-existence of multiple traditions within one cohesive system. He is known among saxophonists for his masterful ability to traverse different musical temperaments. They are supported with superb sensitivity by renowned bassist Mark Dresser and master drummer, Alex Cline. The two first met at a recording session, but had long known about the other through Vijay Iyer and Rudresh Mahanthappa, who were both familiar with what Modirzadeh had been working on for the last 20 years. Throughout 2009, Amir and Hafez got together at every opportunity even though one lived in New York and the other in Northern California to collaborate on what would become Radif Suite. Comprised of two suites: Radif-e Kayhan by Modirzadeh, and Copper Suite by ElSaffar, the result is neither constrained by the western system of equal temperament nor the Middle Eastern single-tonic system, but allows each musician to explore music from a palette full of tonal possibilities. The music is also unbound by meter look at their scores and you immediately notice the lack of bar lines so rhythmic phrasing occurs with greater fluidity. In addition, both ElSaffar and Modirzadeh have developed new techniques on their respective instruments in order to play Arabic microtones and ornaments. By using alternate fingerings and masterful control of embouchure to manipulate pitch, they are able to break free of the boundaries of equal temperament into new tonal orientation. This results in striking new melodies and harmonies, unbound by tradition, that encompass the entire phenomena of sound. Using Middle Eastern tonal systems to transform the jazz idiom, the music still speaks the language of swing, driving improvisations, blues sensibility, balladry and group interaction. In the process, ElSaffar and Modirzadeh are further breaking down tonal and rhythmic barriers and helping to take jazz away from an accepted set of standards and practices into an entirely new world.